Liquefaction of lignocellulosic and cellulosic biomasses produces different polyol properties. Hence, direct comparative studies on the properties of both biomass liquefaction-derived polyols and polyurethane foams (PUFs) have been extensively performed. 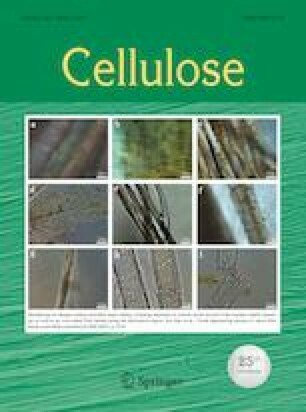 Optimization of oil palm empty fruit bunch fiber (EFB) and EFB-based cellulose (EFBC) liquefactions was performed in cosolvent polyethylene glycol–glycerol to produce polyols. Hydroxyl (OH) and acid numbers, viscosity, molecular weight, and chemical functionalities of the polyols were analyzed and compared. The optimum liquefaction temperature for both EFB and EFBC was 175 °C. However, the optimum liquefaction time of EFBC (180 min) was longer than the time recorded by EFB (90 min). Liquefaction temperature and time had influenced degradation and recondensation of liquefied biomass products, hence affected the properties of polyols. Extreme degradation and recondensation during liquefaction had reduced the OH number of polyols. Recondensation significantly affected the molecular weight and viscosity of the EFB polyol, but not those of EFBC polyol. Rigid PUFs synthesized from the optimum EFB and EFBC polyols were denoted as EFB PUF and EFBC PUF, respectively. EFB PUF possessed larger average cell diameter than that of EFBC PUF. Comparatively, the thermal decomposition and compressive strength of EFB PUF were lower than those of EFBC PUF. This study was financed by Universiti Kebangsaan Malaysia (UKM), Universiti Malaysia Pahang (UMP) and Malaysian Ministry of Higher Education (MOHE) via research grants [Grant Numbers AP-2015-005 (from UKM), DIP-2016-004 (from UKM) and RDU160329 (from UMP)]. The authors gratefully acknowledge the instrumental services provided by the Center for Research and Instrumentation Management (CRIM), UKM.